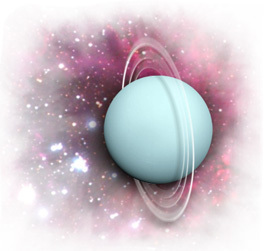 The planet Uranus was the first to be discovered using a telescope. Unlike the first six planets from the Sun, it is nearly impossible to see Uranus with the naked eye. A telescope is required in order to catch a glimpse! And even then, this pale-blue planet seems dull in comparison to the others. Images taken by the Voyager 2 spacecraft in 1986 confirmed the planets lack of detail. Like Jupiter and Saturn, Uranus is also classified as a "gas giant" and is made up of mostly hydrogen and helium. However, some astronomers also categorize planet Uranus, along with Neptune, as "Ice Giants" because of the many "ices" found there made up of water, ammonia, and methane. This is what gives the planet its pale-blue color. The most unique feature about Uranus is that it spins completely on its side as it orbits the Sun. Scientists believe this was caused by a massive collision that occurred billions of years ago as the planet was forming! *It is the 7th planet from the Sun. *Uranus has "rings" similar to Saturn. However, there are only about 11 of them and can only be detected with special spacecraft equipment. *The planet was named after the ancient Greek god Uranus, father of Cronus (Saturn) and grandfather of Zeus (Jupiter). *Uranus has 27 moons, most of which are named after characters from plays written by Shakespeare. *The planets color and lack of detail are caused by the methane gas in its atmosphere, which absorbs red light from the Sun. 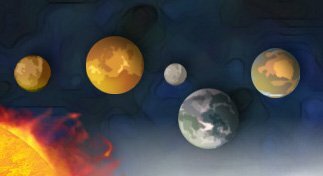 Return to the kids Solar System page!